A Xeuss 2.0 HR SAXS/WAXS instrument was installed last summer at the University of Texas El Paso in the department of physics. The instrument is used primarily to advance the main research program of the Nanomaterials, Interfaces, and Confinement for Energy & the Environment (NICE2 ) Laboratory headed by Dr. José Leobardo Bañuelos. This includes work through collaborations at UTEP in physics, geology, chemistry, and engineering, and several U.S. and international collaborators. “The instrument is primarily being used to investigate the structure of room temperature ionic liquid-based electrolytes, highly porous electrodes, and the fluid-solid interface of materials for use in electrical energy storage applications, such as supercapacitors”, Dr Banuelos explains. “We are currently investigating nanoscale heterogeneity in several electrolyte mixtures. We will soon develop the capability to perform simultaneous electrochemical and SAXS measurements to understand how the fluid-solid interface changes during power cycling in energy storage materials. Other projects under development include studies of the solution-state structure of proteins during folding and unfolding, the characterization of protein aggregation, and analyzing new ways to prevent protein aggregation, in relation to misfolding diseases such as Alzheimer’s. 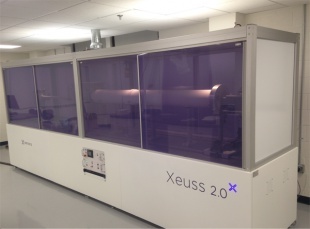 Dr Bañuelos is very enthusiastic about the instrument : “The Xeuss 2.0 HR is built with components currently in use in several world-class leading synchrotron research facilities, including the hybrid scatterless slits and Dectris detector technology. The x-ray source provides excellent flux on sample and has very little maintenance. The Xeuss is a very open platform that allows integration of a variety of sample environments. The user has control over each component of the instrument, which makes it possible to explore new instrument configurations and experimental approaches. Because the instrument is modular, this allows us to upgrade it with new features in the future. 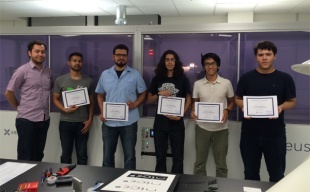 The three graduate and six undergraduate students who currently compose the group are all being trained to operate the instrument and carry out the collaborative research program of the group. About the Nanomaterials, Interfaces, and Confinement for Energy & the Environment (NICE2 ) Laboratory. The NICE2 group headed by Dr José Leo Bañuelos is investigating the physicochemical properties of nanoscale fluid-solid interfaces in areas of significant societal and economic importance, such as energy storage and conversion, natural resource management, environmental remediation, and nanomedicine. One focus of the group is to understand how surfaces and confinement affect the properties of complex fluids at the nanoscale. This involves using a combination of experimental techniques to elucidate the structure and dynamics of matter at the molecular level, and work with computational scientists to bring additional insights from theory and simulation. The group is currently developing simultaneous small angle scattering and electrochemical measurements capabilities to elucidate the nanoscale structural changes that occur in electrical energy storage systems during power cycling.